I collect postcards. And I love getting mail. Therefore, I get even MORE excited when I receive a postcard in the mail! So I had accumulated all of these postcards over the years and I wanted to put them up in my dorm room. And so I started putting them up and then inspiration struck – I started building up a Postcard Tower! But this tower was all by its lonesome…so I decided to launch The Great Postcard Skyline Project, previously known as The Great Postcard Landscape Project (I changed it, because I think Skyline is a more accurate term). 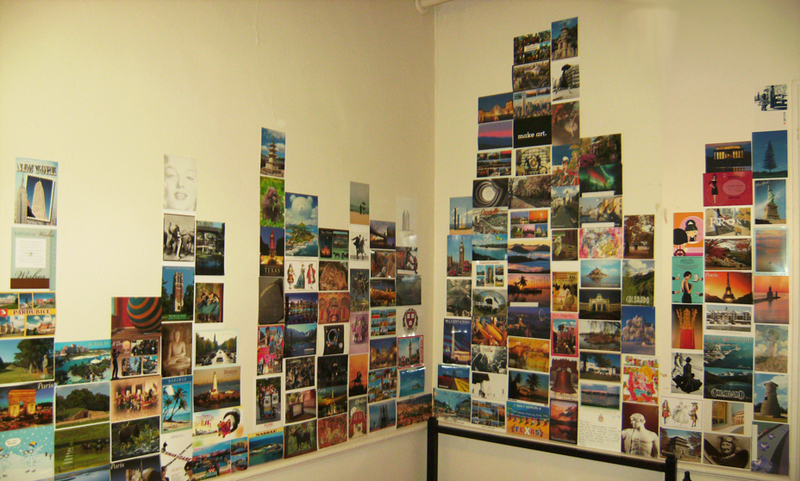 Hopefully, I’ll eventually gather enough postcards to make more towers which will eventually build up to becoming a skyline of postcards on the walls of my room! So. If you want to help, send me a postcard! If you’re interested in the progress of the project, you can see what I already have. And it’d be beyond awesome if I could reach the lofty goal of having cards from all over the US and all over the world, so click to see where I don’t have postcards from! If you’re interested in exchanging, feel free to shoot me an e-mail! Thank you so much for helping me with The Great Postcard Skyline Project!!! News Update 06.09.2010 – As it is now summer vacation, I am no longer in my dorm room, but fear not! Postcards can still be sent to the address above – I just won’t get them until later. Also, as we are changing rooms, I have to start the Skyline over, but I believe we have a long hallway in our suite next year, so it could quite possibly be more epic than ever! And for the most exciting news, thank you SO SO MUCH to Smith Magazine (home of the Six-Word-Memoir, which I also love) for featuring the Great Postcard Skyline Project! News Update 07.31.2010 – So, I took a shot at making a video for the Great Postcard Skyline Project. Keep in mind that this is just a stepping stone to better videos to come (also because I’m a total newbie to making videos), so be forgiving, please? Hehe. News Update 07.28.2012 – Well, now I’ve graduated from college and I’m no longer living in a dorm room! It’s been a while since I’ve done this project, but I think now is a good time to revive it – to celebrate having my own place and to keep in touch with people who are going in so many different directions. Hoorah! I’ve updated my address above. It kinda does, doesn’t it? 🙂 Thank you so much – I really appreciate the support!!! I love postcards and I loved the idea, I’m sending you a postcard tomorrow!